Shin Shin Toitsu Aikido Documentary!!!! The documentary features Kashiwaya Sensei, 8th Dan, head of the Midland Ki Federation of which we are a member. Enjoy!!! Learn a Skill That Will Last a Lifetime. Beginners Always Welcome!!! Pay us a visit and learn more about Shin Shin Toitsu Aikido. 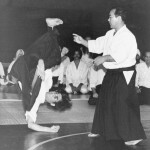 It differs from many other styles of Aikido by demonstrating how the power of the mind influences the body and makes techniques more flowing and powerful. So practice is not only good for the body, but the mind as well. Come and watch a class or take a free class. Ask plenty of questions. We have a welcoming and friendly atmosphere. Aikido helps us live in harmony, not only with others, but ourselves, as we learn how thoughts and feelings affect our movements and our daily lives. The goal is not to harm others or gratify one’s ego. Learn a skill that you can keep for a lifetime. Read our Frequently Asked Questions (FAQ) page to learn more. Feel free to write or call us to ask any questions. South Mountain Aikido is a member of the Midland Ki Federation of the Ki Society. Our Chief Instructor is Koichi Kashiwaya Sensei, 8th Dan. See the pictures from our October training camp in Frederick. Our teaching philosophy: “Spare no effort when you teach. You advance as your students advance. Do not be impatient when you teach. No one can learn everything well at one time. Perseverance is important in teaching, as are patience, kindness and the ability to put yourself in your students’ place.” – Tohei Sensei. South Mountain Aikido Fall Camp Pics!!!! Guest Instructor: Kashiwaya Sensei, 8th Dan. See other pics: Click Here for Facebook. Come take a free class or just watch! No obligation. Meet some great people.